Digital Grotesque consists of two full-scale grottos that were 3D printed out of sandstone. Grotto I is a commission by FRAC Centre, Orléans, for its permanent collection. It premiered at the Archilab 9 exhibition in 2013. Grotto II is a commission by Centre Pompidou, and premiered at the Imprimer le monde exhibition in March 2017. Both grottos are highly ornamental structures that are entirely designed by algorithms. They are optimized to present highly differentiated geometries that forge a rich and stimulating spatial experience for the observer. A subdivision algorithm exploits the 3D printer’s full potential by creating porous, multi-layered structures with spatial depth. A single volume spawns millions of branches, growing and folding into a complex topological structure. Hundreds of square meters of surface are compressed into a 3.5 meter high block that forms an organic landscape between the man-made and the natural. Standing in front of the grottos, one is struck by a hitherto unseen richness of detail that is at times overwhelming. Digital Grotesque is a testament to and celebration of a new kind of architecture that leaves behind traditional paradigms of rationalization and standardization and instead emphasizes the viewer’s perception, evoking marvel, curiosity and bewilderment. With Digital Grotesque, we aim to create an architecture that defies classification and reductionism. We explore unseen levels of resolution and topological complexity in architecture by developing compositional strategies based on purely geometric processes. We use these algorithms to create a form that appears at once synthetic and organic. The design process thus strikes a balance between the expected and the unexpected, between control and relinquishment. The algorithms are deterministic as they do not incorporate randomness, but the results are not alwaysa entirely forseeable. Instead, they have the power to surprise. The resulting architecture does not lend itself to a visual reductionism. Rather, the processes can devise truly surprising topographies and topologies that go far beyond what one could have traditionally conceived. Digital Grotesque is between chaos and order, both natural and the artificial, neither foreign nor familiar. Any references to nature or existing styles are not integrated into the design process, but are evoked only as associations in the eye of the beholder. As a fictive narrative space, the Digital Grotesque project is less concerned with functionality than with the expressive formal potentials of digital technologies. It examines new spatial experiences and sensations that these technologies enable. As such, Digital Grotesque is a lavish, exhilarating space, full of details at the threshold of perception, waiting to be discovered and spurring one’s imagination of what is yet to be created. New materials and fabrication methods have historically led to radical changes in architectural design. They have indeed been the primary drivers in its evolution. Today, additive manufacturing heralds a revolution in fabrication for design. Yet in architecture, this technology has up to now been used only for small scale models. 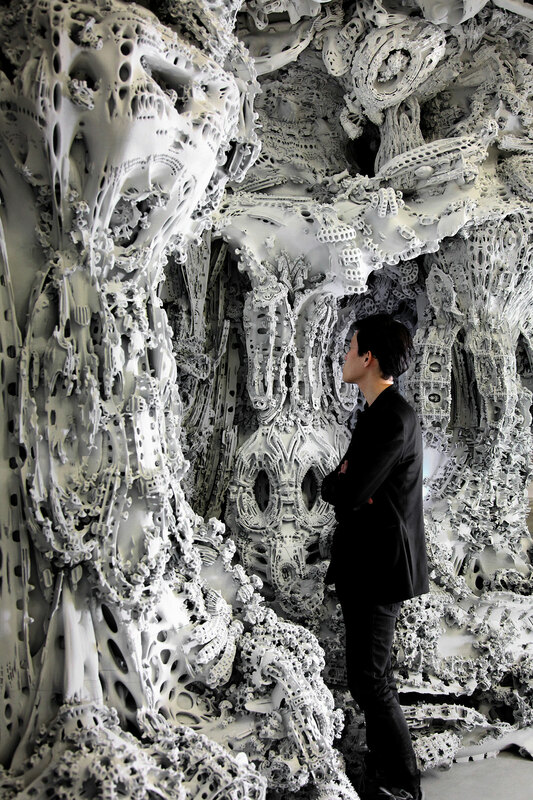 Digital Grotesque takes additive manufacturing technology to a true architecturalc scale. Not a small model is printed, but the actual room itself. Digital Grotesque presents a fully immersive, solid, human-scale enclosed structure with a perplexing level of detail. Its geometry consists of hundreds of millions of individual facets printed at a resolution of a tenth of a millimeter, constituting a 3.2-meter high, 16 square meter large room. The potentials of additive manufacturing in architecture are enormous. Architectural details can reach the threshold of human perception. There is no longer a cost associated with complexity, as printing a highly detailed grotto costs the same as printing a primitive cube. Nor is there a cost for customization: fabricating highly individual elements costs no more than printing a standardized series. Ornament and formal expression are no longer a luxury – they are now legitimized. The question today is: What would a grain of sand like to be?